The end times can be confusing, or even troubling, as we struggle to understand such things as when Christ is coming back, who the Antichrist will be, when the tribulation will occur, and how to interpret biblical prophecy. If you are curious, confused, or fearful about any of these things--this book is for you. 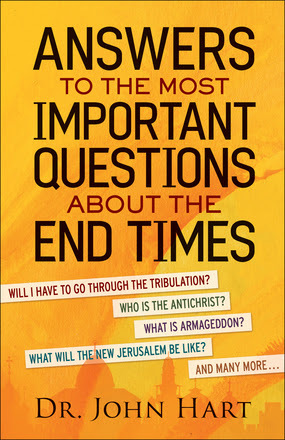 Dr. John Hart clearly and respectfully offers easy-to-understand answers, letting you know exactly what God's Word says--as well as what it doesn't say--about the end times. This slender volume answers the most frequently asked questions, then explores how those answers affect you, your family, and your friends. 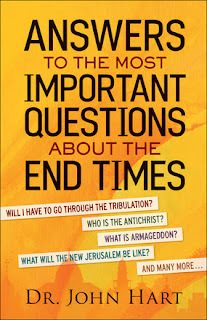 I requested the Answers to the Most ImportantQuestions About the End Times in hopes of finding a book that would give me a better understanding of a topic that can be confusing. Dr. John Hart does a good job laying a foundation with scripture plus a timeline of events that lead up to and happen after the rapture. The timeline is not one that is set in stone, but rather a guideline for a better understanding of possible events. He also does a good job giving definitions of terminology as well as a breakdown of the happenings in the book of Revelation. If you have questions about the end times and would like some basic information as well scripture references, this is a good place to start. I am not endorsing that everything on the book is gospel, because I am not an expert on the topic, but I do believe Dr. Hart has made a great effort to understand these biblical principles. I received this book from Bethany House in exchange for a fair review. When Did Jesus Leave the Room?